All group classes are one hour in length. Class attendance is by appointment only. If you are interested in getting started, please call for a complimentary tour and introduction. Class Schedule Updated for Winter 2017. Please call or text to book your spot. A 24 hour notice of cancellation is necessary. 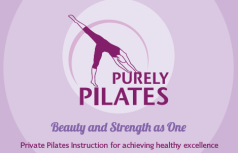 Click here to see Class Descriptions for more information about training with Tracey at Purely Pilates.